Over recent months I haven’t produced much work that has been visible in public. The HTML/CSS I did for Ning has been pretty much the only example you could see, and much of that has already been re-worked. It’s hard to keep up. 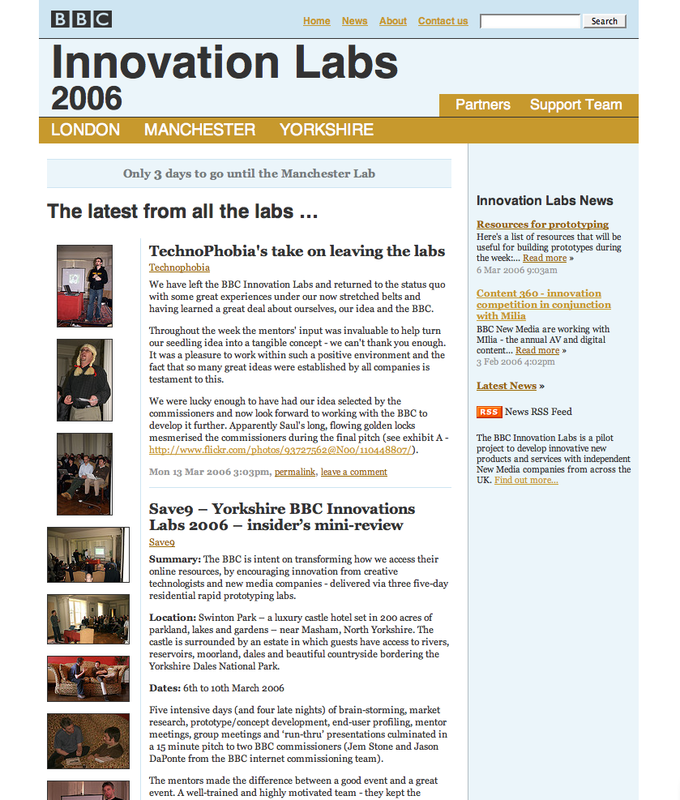 But last week my new website for BBC Innovation Labs went live. For once the whole thing is my own work: design, HTML/CSS and bags of Movable Type. There’s a smidgen of PHP in there too of course — I think it’s pretty much impossible to produce anything but the simplest of weblogs in MT without stirring in a mess of plugins and PHP or Perl. I’m the first to admit that my design muscles don’t get much exercise these days but I’m pleased with how the design turned out. I like to think it’s a nice balance of modern and friendly. Blue and brown have always been the new [whatever]. The Innovation Labs are a series of three events where teams from small companies get together to prototype ideas and pitch them to BBC folk. The site has a weblog for each event and the teams taking part can post their experiences and upload photos to the Flickr pool. The Yorkshire Lab was last week and it looks like the teams have been way too busy to do a whole lot of blogging, but hopefully their view from the inside makes the events a little less opaque. Manchester and London still to come, no doubt with further embarrassing photos. We are doing somewhat better with the posts from the North-West, but that maybe because we have more mentors at this Lab (including myself), making the workload more manageable.